Drivetrain, Suspension & Tires Discussions on ATV drivetrain, suspension, and tires. That's the same size as the SunF A033 rear tires I got in my set of 4 tires from amazon last year. I just checked and it says they're 30 pounds each. Not very light but most other 26" tires are heavy too. You may have to shop for knobby tires if you want something light but most are 23" or less. Or you can get a general use tire like AT489s and similar styles. They're lighter than a lot of other tires because they have less plys and shorter lugs. 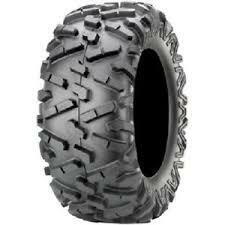 A033s are the top pick on this new list of the 25 best ATV/UTV tires. So far I've only used them when I plowed snow, but one of my friends has had them on his Sportsman 850 long enough to know they work great up north on the dirt and sand trails, and around home year round. Good luck on your quest and keep us posted. The Wanda tire tread pattern is the tread design I prefer, more like a sand paddle, that I believe would dig better in loose/fine sand similar to a sand paddle! but there not true to size, also the Mars mud lite's, that are the same similar pattern, and that mistakenly bought, that are advertised 11'' but after mounting measure exactly 9''....2'' less than stated! So I mounted them on the front rims instead. I can't find a tire pattern like the Mars or Wanda lites in a true 11'' wide, and a true 26'' in height after mounting. Which also resembles closer a sand paddle, than any other aggressive tire I can find, unlike a sand paddle that can only be used for sand and not gravel/paved roads, and hard pack.that the Wanda style is rated for. They look a lot like mud tires which are generally heavy. MASSFX MS tires look like they would do the job. They're $82.83 apiece, so that would be $165.66 for 2 of them at massdepot. For $74.33 more you can get a full set from amazon with 26x9-12 front tires. 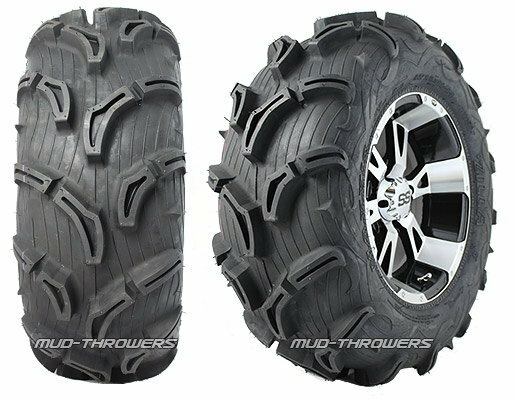 That looks like the tire I'm looking for (MASSFX MS tires) but do they run true to size for width and height? I already have 2 sets of new tires I cant use, because their advertised sizes were way off! 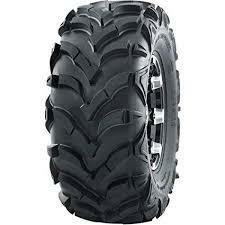 Too bad there's not a compiled list of, all ATV tires, for their actual true to size and weight! I've looked everywhere and can't find anything/anywhere! Check the 38 reviews and 22 questions answered on amazon. I read some of the reviews and one person said they were, or appeared to be, the advertised size. I think they said that but it was a whole day ago and I didn't try to remember it so maybe not. They look kind of like mud tires too but it says the tread depth is only 1/2" high. They should be lighter because of that, and as long as you're mostly on sand and not pavement maybe they'll last long enough. You could be the guinea pig and post your findings. 3 miles into the first ride with these tires one popped on a gravel trail no sticks no sharp rocks just class 5 gravel. also i bought 26x11x12 and the accual height of the tire is 24.5" at 5psi. Big Horn's seem to run heavy about 30#'s, compared to other lite brands.